Although Linux is easy to manage using the command line, however, Web Hosting Control Panel is a must required feature by most users. 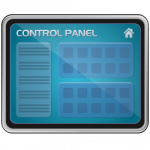 Linux Hosting Panels Setup and Configuration will show how to setup and configure different types of Linux Control Panels. The focus will be on specific Control Panels especially for Web Hosting Solution, control panels should give you the opportunity to create Hosting accounts for you, families, friends, and customers.